The theme is a blend between the casual elegance of a modern tropical vacation and a sense of mystery and adventure from the time when pirates roamed the seas of the Caribbean. The Caribbean Beach Resort is located in the Epcot Resort Area, just south of Epcot and east of Disney’s Hollywood Studios. 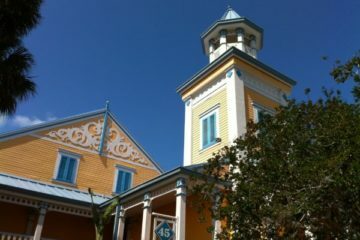 It is one of Disney’s moderately priced resorts, and in fact was the first resort to carry the “moderate” designation. Originally classified as a deluxe resort, Disney decided that it seemed unimpressive when compared to the other resorts in that category. They created the moderate category to accommodate this discrepancy. 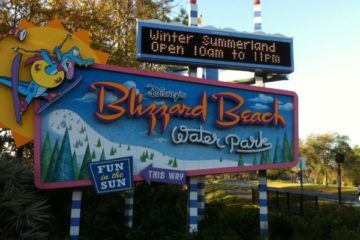 The “beach” in Caribbean Beach consists of the miles of white sand and grassy shores along 45-acre Barefoot Bay. The villages of the resort, six in all, completely surround this beautiful lake. 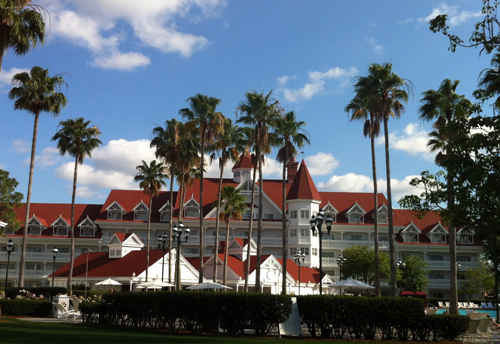 This is a very large resort; in fact, in terms of acreage this is the largest resort on the Disney World property. Due to its size, an internal bus service circles the resort to help guests navigate the property. Disney’s Caribbean Beach – like a trip to the islands without leaving Florida. The six resort villages are named after Caribbean islands, or island nations. Counterclockwise starting with the village farthest from the entrance are Trinidad South, Trinidad North, Martinique, Barbados, Aruba, and Jamaica. The villages are all similarly-themed, and do not feature any significant design elements to differentiate them from each other. The small Custom House, set off from the main body of the resort, contains the check-in desk, the concierge desk, and guest services. Between Trinidad North and Martinique is Old Port Royale Centertown, which contains the feature pool area as well as resort dining. 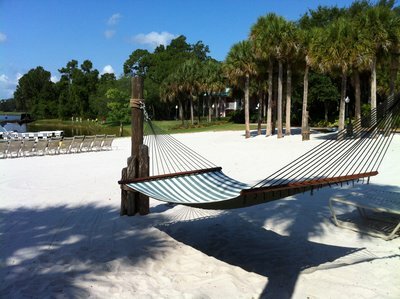 In the middle of Barefoot Bay near Old Port Royale and Jamaica is the small island of Caribbean Cay, where guests can relax in a hammock or enjoy a peaceful and secluded getaway. Each village at the resort has its own smaller pool area, its own beach, and its own coin operated laundry services. Martinique, Jamaica, and Trinidad South also have their own children’s playgrounds. The white sandy beaches throughout the resort are inviting places to relax. 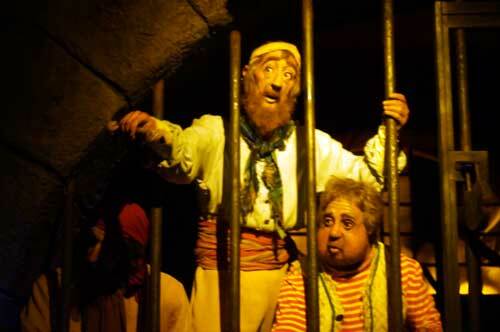 Most of the rooms are decorated with tropical colors, but a few special rooms are decked out as befits a band of swashbuckling pirates. The beds are miniature ships with masts and rigging, and a pirate skull decorates the curtain between the main room and the bathroom. If you have a huge pirate fan in your clan, then reserving these rooms (which carry an extra fee) can be fun. Water sports, unsurprisingly, are the most popular form of recreation at the Caribbean Beach Resort. With the six pools, numerous beaches, and 45 acres of lake, there are very few water based activities that aren’t possible at this resort. In fact just about the only activity not permitted is swimming in Barefoot Bay – although the plethora of pools mostly make up for this limitation. The large signature pool is located at Old Port Royale Centertown. 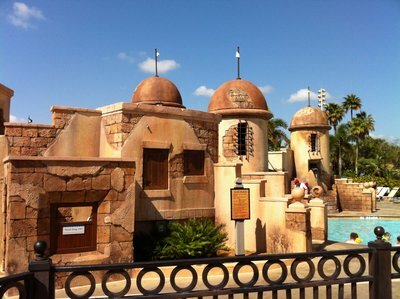 This pool is designed to resemble an old Spanish fort, complete with water cannons and two slides. Two spas and a children’s water play area are located nearby, and the main pool also features a zero depth entry platform ideal for young waders. The dock and boatyard at Old Port Royale rents a variety of boats including sailboats, pontoon boats, canoes, and pedal boats. This complex also contains the Goombay Games Arcade, and the bike shop where guests can rent bicycles or surreys to help them explore the resort. A trail measuring approximately 1.4 miles runs along the shore of Barefoot Bay, and is a popular route for walkers, joggers, and bicyclists. The large central pool is well themed to the Caribbean. 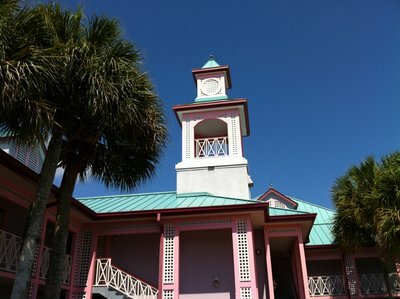 There are two dining establishments at the Caribbean Beach Resort, both located at Old Port Royale Centertown. Both are casual, rapid service places with a nod to the tropical nature of the resort. At the Port Royale food court you might just be convinced that you are dining at street-side cafes in the old town of Port Royale. The food court features fives different fast food counters. The Grab ‘n Go Market is a great stop for breakfast pastries. 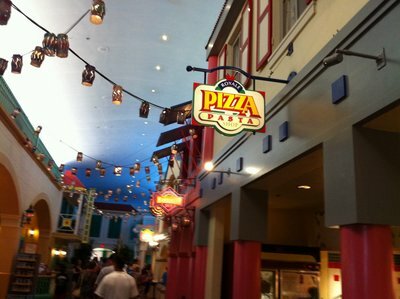 The Royale Pizza & Pasta Shop and the Old Port Royale Hamburger Shop serve a selection of food court favorites. Bridgetown Broiler specializes in chicken, but also has hot breakfasts such as made-to-order omelets. Finally, Montego’s deli brings a slice of New York to the Caribbean with favorites that include delicious New York-style cheesecake. The Old Port Royale Food Court is a busy place with many different food choices. This sit-down casual restaurant serves Caribbean-inspired American dishes such as pineapple marinated chicken. A variety of tropical drinks and smoothies are also available. As the name suggests, the walls of the dining room are covered with colorful shutters. 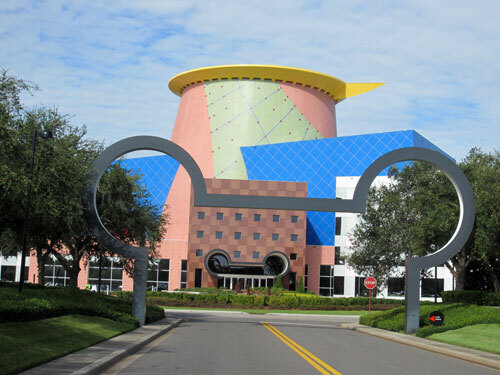 It can be a bit time consuming to navigate a resort as large as the Caribbean Beach Resort. Although the internal bus service helps, waiting in line for the bus and the frequent stops means that it can still take time to get from some villages to the dining establishments and feature pool at Old Port Royale. Some guests enjoy the leisurely and secluded feel of the more distant villages, but guests looking to make the most out of their time at Disney can streamline their vacation by requesting rooms at Jamaica, Aruba, Martinique, or Trinidad North. These villages are the closest to Old Port Royale and the main attractions of the resort. This resort also offers relatively few dining options when compared to some of the other resorts. 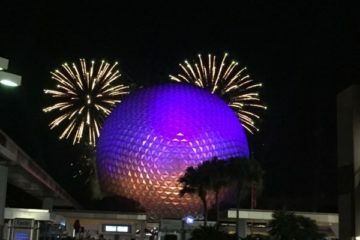 If you plan to eat most of your meals at the theme parks or at other resorts you will find plenty of variety, but if you plan to spend lots of time including mealtimes at your Disney resort, you may want to select a location with a few more options. If you love the water and sunbathing on a white sandy beach, the Caribbean Beach Resort can provide you with your own tropical paradise at a reasonable price. The size of the resort truly makes you feel that you are in another world, but it is also best to enjoy this resort at a leisurely pace. Guests on the go may prefer a smaller resort with a more convenient location, but if idling away the hours in a hammock with a tropical drink sounds like your idea of heaven, then Caribbean Beach could be for you.